Loads of Vans is home to a wide selection of vans from a host of different brands including the complete range of new Citroën vans to help you get the job done right. Visit our Loads of Vans showroom in North Cheam, Surrey, to see our current range first-hand. 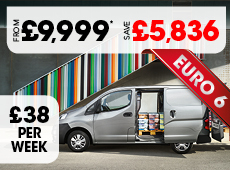 Citroën’s top-quality range of LCVs are perfectly suited for business use whether you’re an independent sole trader who needs a reliable van, or a transport manager looking for an entire fleet to equip your team. You can rely on Loads of Vans to meet your every need. A wide selection of brand new models is available to suit a whole variety of professional needs ranging from the compact yet durable Nemo to the versatile and durable Relay. Other options include the Berlingo small panel van and the mid-size Citroën Dispatch, both of which are available in automatic transmission. The large Relay van has also been configured as an electro-hydraulic tipper and a conventional dropside to add an extra dimension to the range. In addition, with many models coming in a range of heights, lengths and a variety of configurations, there’s sure to be one that seamlessly fits the needs of your business. It’s up to you to find your perfect partner. Don’t forget to ask about our flexible finance options, which our impartial advisers are happy to discuss with you. You can pay in cash, or we can also arrange finance lease and hire purchase agreements – just ask and we’ll see what we can do. You can view up-to-date availability online, and start the search for your ideal new Citroën van today. Simply click on a model you’re interested in to find out more about it.